•	A bird’s eye view of modern physics at the cutting edge. 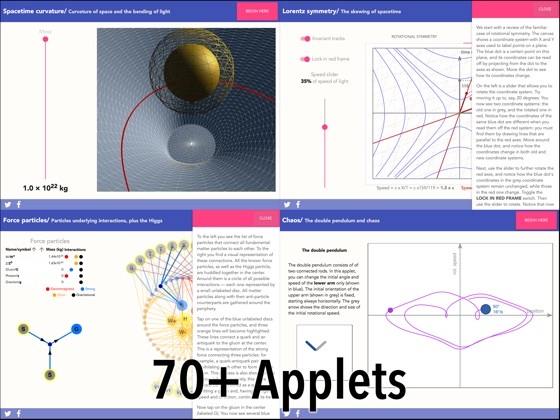 •	76 interactive applets, many involving real time physics simulations. •	Animations and movies to illustrate complex concepts. •	A website for discussions that includes the participation of the author on the topics explored. Vatche Sahakian is a professor of physics at Harvey Mudd College, a premier STEM-focused institution located in Southern California. He obtained his PhD in theoretical physics from the University of Chicago in 1999. Since then, he has held research positions at Cornell, Caltech, and Institut des Hautes Études Scientifiques in Paris. He specializes in string theory. Sahakian is the author of 20+ scientific publications on the subjects of string theory and cosmology. His research focuses on understanding the small scale structure of space, in a context where both gravitational dynamics and quantum mechanics become important. This realm often involves studying black holes, unravelling exotic dynamics such as non-commutative geometry, and exploring new frameworks that extend the Standard Model of particle physics and standard inflationary cosmology. Over the past centuries we have learned a lot about the universe. As physics expands our understanding of it, one needs more time and effort to acquire a broad perspective of the field. Simultaneously, as the impact of physics on society increases — from applications in space, electronics, information technologies — it becomes ever more important that this knowledge-base of the fundamental sciences is widely shared and appreciated. 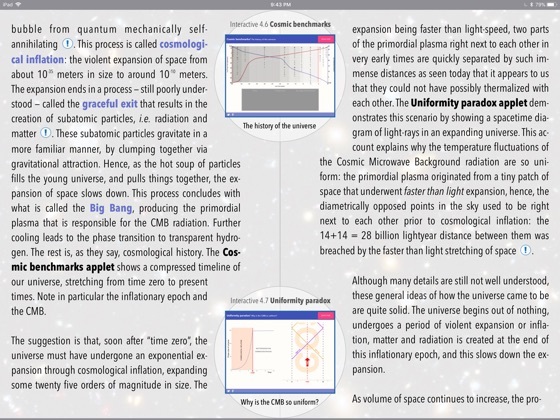 This electronic book takes advantage of the latest technologies to present a most up-to-date, mature, and qualitative exposition of physics. Thanks to more than 70 “applets” that replace mathematical equations, anyone with a high school degree has the necessary background to access the material. 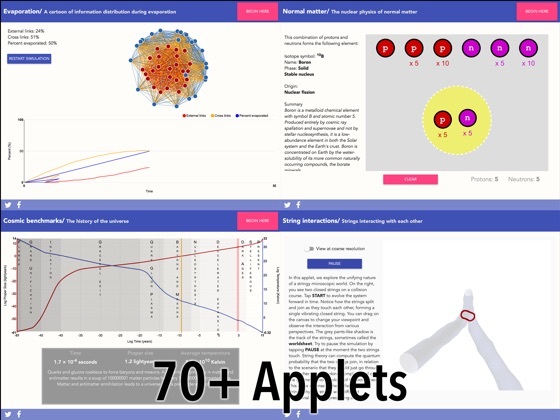 These applets are small interactive applications that allow one to visualize and understand sophisticated ideas without having much background in mathematics. 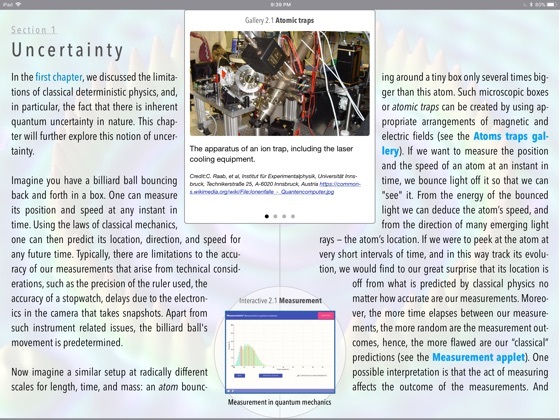 In many cases the applets include fully developed numerical simulations of physics equations that run in real time within the electronic book (ebook)! I believe that until now ebooks have not developed to their full potential — they have been loose unions of traditional text and interactive or multimedia content. This ebook breaks new ground insofar as it integrates the latest interactive visual tools with the text. Without these new technological tools it is virtually impossible to discuss physics at this level of sophistication and at a level accessible to general audiences. Apple’s iBooks platform is currently the only one that makes this possible. The current book might open a new direction in the field of electronic books: instead of trying to replace the wonderful and time tested technologies of ink and paper, it present a new model where the electronic platform complements the traditional book. This chapter provides the conceptual scaffolding for understanding the ideas discussed in this book. 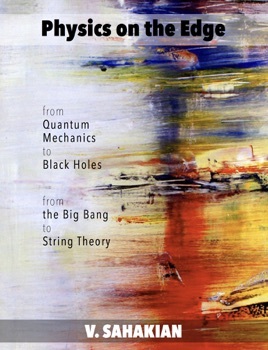 In a few broad strokes it sketches out the basic axiomatic assumptions and outlines a set of beliefs that guides the process of discovery in theoretical physics. Quantum physics is, arguably, the greatest success story of contemporary science. Yet, it remains one of the most counterintuitive theories that bewildered the minds of the greatest 20th century thinkers. It continues to baffle us today, even while we apply its ideas in modern technology. 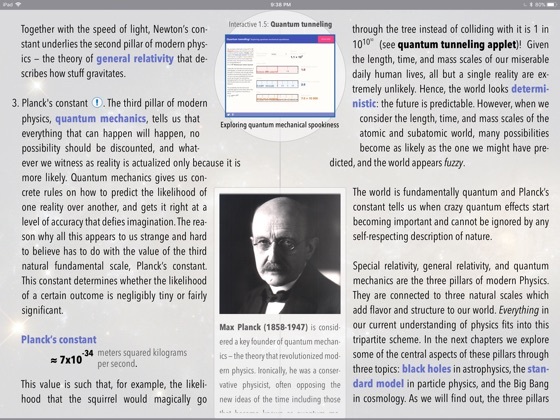 This chapter outlines the main principles of quantum theory, describes what it helps us understand about the microscopic world, and discusses the puzzles to which it leads. Black holes are the most extreme phenomena in the universe. They push the limits of our imagination and drive our formulations of the laws of nature to their breaking point. This chapter discusses relativity —both special and general — which allows us to understand a cornucopia of puzzles associated with black holes. Understanding the cosmos is arguably the most profound endeavor in physics. It leads to questions about the nature of space and time, the origins of all matter and energy, the ultimate fate of the universe, and grand coincidences associated with our presence in this world. In this chapter, we explore all these topics and the puzzles they lead to. String theory may be viewed as a framework for exploring new exotic ideas on the frontier of theoretical physics. At its heart, the subject aims to reconcile quantum mechanics with gravity; it also attempts to unify and complete the Standard Model of particle physics at short length scales. The subject’s most prevalent successes to date are twofold: convincing evidence that the theory resolves various long standing puzzles arising in black hole physics and quantum gravity; and phenomenological extensions of the Standard Model that mimic the world as we see it at low energies. While the theory itself as a whole may still evolve beyond its current form, several of the new ideas that it has developed might be expected to survive at the foundation of any future fundamental formulation of the laws of physics. In this chapter, we give a brief overview of the main premise of string theory, and then focus on several of the key ideas that it leads to.